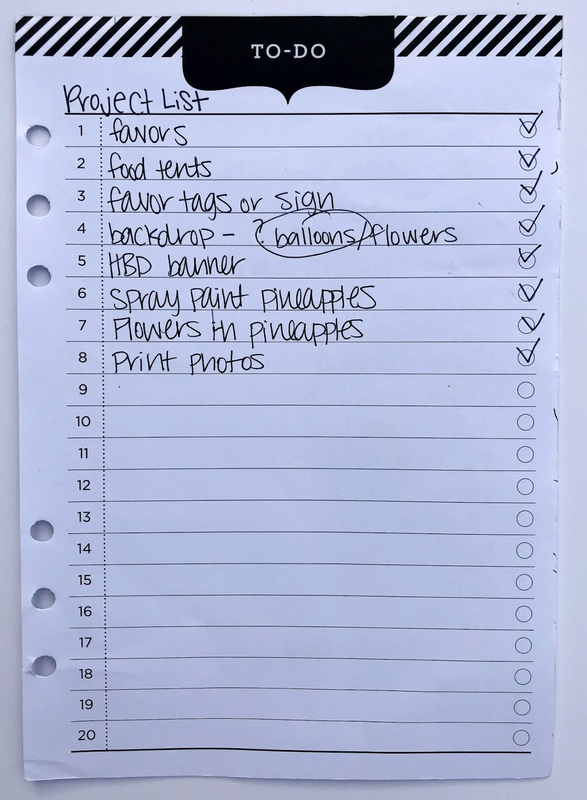 When you’re planning a party or event, do you ever feel scatterbrained and overwhelmed with everything that has to be done? The theme, the color scheme, the food, the drinks, the decorations, the games, the guest list, all the things you have to buy? I know I do! 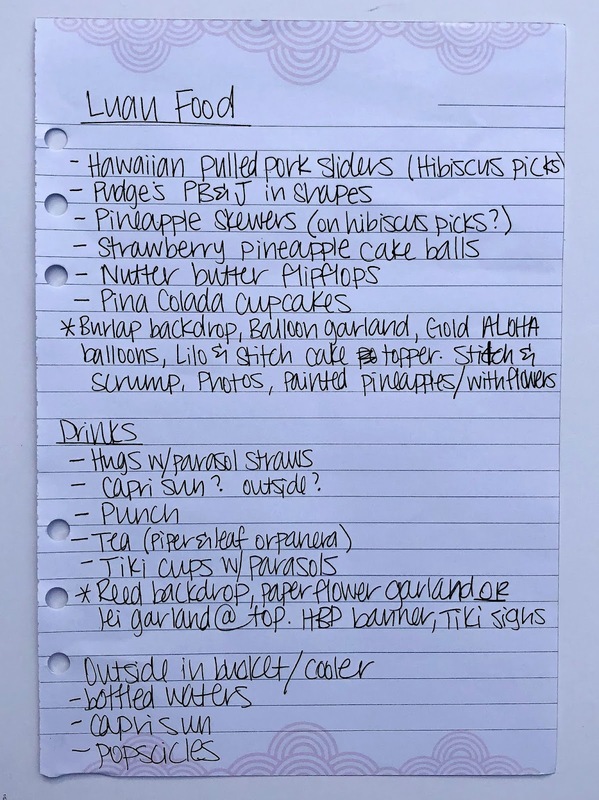 I’ve planned my fair share of parties over the years, but I still tend to get overwhelmed, especially at the very beginning of the planning process. How in the world am I going to pull this all together?! I have to slow down and remind myself to take it one step at a time. 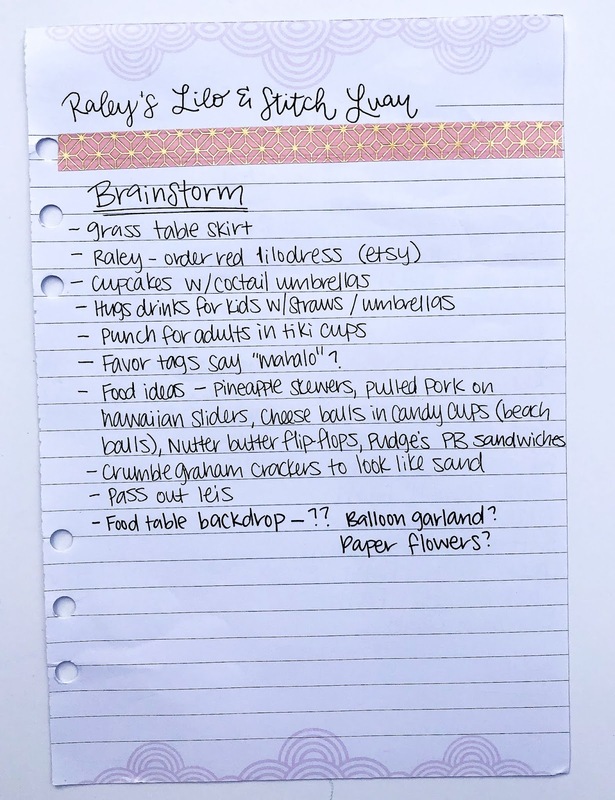 There are a few things I have found that help me stay organized and feel less like a scatterbrain throughout the process of planning an event, and I’d like to share those with you today! Make a list of all of your ideas, thoughts, and #Pinspiration so that it’s all in the same place. Write it all down. Even if it doesn’t all make sense together or if you’re not sure it’s something you actually want to use – write it down anyway. Gather all of your favorite elements onto one piece of paper and you can review it later. Get rid of any elements that don’t fit into the overall theme or feel of the party (or into the budget). There are so many times that I love the look of something I’ve seen on Pinterest, but it either costs too much or it doesn’t fit in with everything else that I have going on, so I have to scratch it. For this particular party, I wrote down my plan for the food and drink tables on the actual “Food and Drink” list. Sometimes I write down my decorations separate. Whatever works best for you! If you have people willing to help you with a party or shower, by all means, let them! Don’t try to take it all on by yourself if you can help it because it can definitely be a daunting task. Decide what you want to do yourself and what others are able/willing to help with, then pass off those tasks and let them take care of it. And hey, since you’re making lists, just go ahead and make a list of who’s doing what! This is especially important if the party is somewhere other than your own home. It helps ensure that you bring everything you need with you. Think of the little things you may need ahead of time like scissors, ribbon, pens or markers, tape, push pins, safety pins, hot glue gun with extra sticks, etc. Also think about how you will want your table set up, how you want to serve the food, and what “fillers” you may want to use – vases with flowers in them, framed photos, books to put things on for height, serving platters or stands, something to put utensils in, etc. – The palm leaves on top of the burlap brings some color to an otherwise neutral table cloth. – Raley’s stuffed Stitch on the table (Her Scrump was sitting on the drink table). 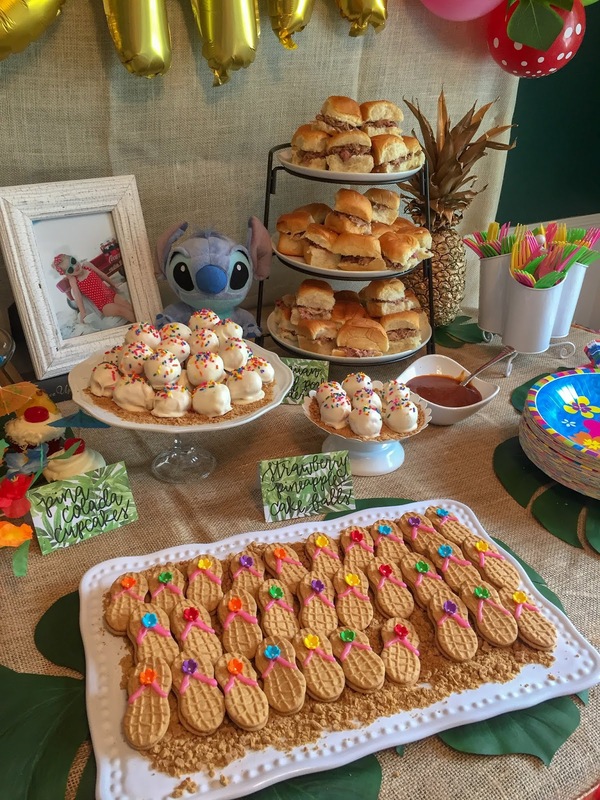 I also ordered little Lilo and Stitch figurines and used them as toppers for some of the cupcakes. 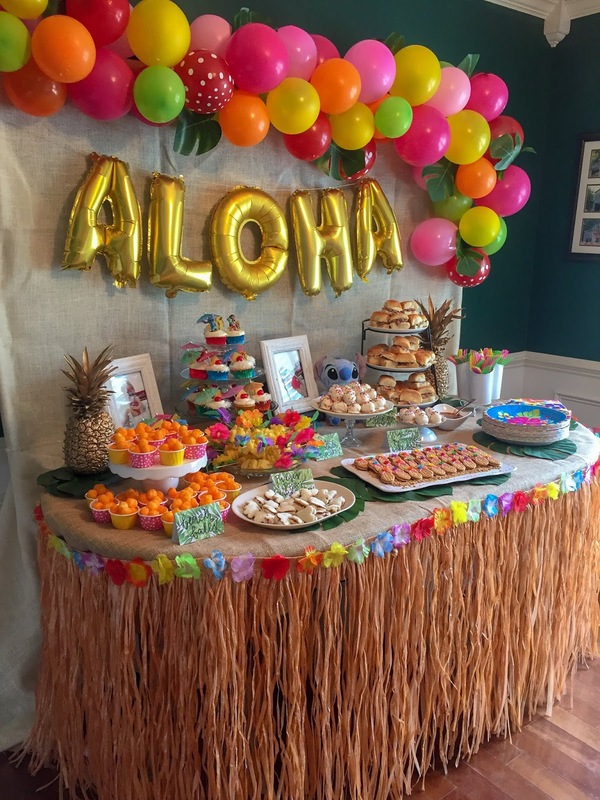 Without these features from the movie, this party would have just been a luau! 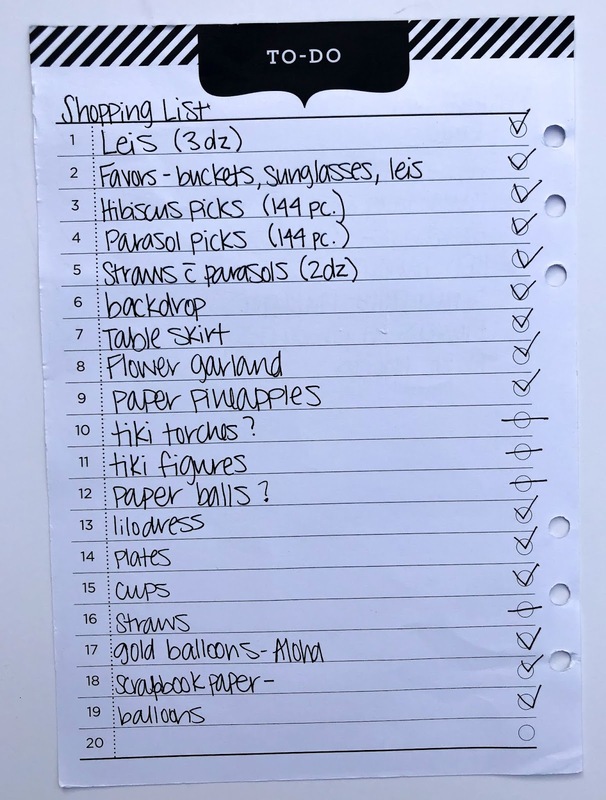 Be sure to think about these things as you’re making your packing list. You don’t want to get to the party and realize you’ve forgotten something important. I try to mentally go through the party in my head as I’m making the list – how am I planning on setting everything up? What will I need to make this happen? How will my table(s) be laid out? What will my food be served on? Be sure and check through your list one more time just before you head out the door to be sure you’ve got everything and your party is sure to be perfect! – Be sure to get your invitations sent out at least 2 weeks ahead of time. If you’re ordering a custom design from somewhere like Etsy, be sure you know the turn around time of the shop you’re ordering from and give yourself enough time to get them printed. – If there’s anything that needs to be ordered, order well in advance, just in case it’s not what you want and you need to find another alternative. – Don’t forget paper goods and plastic utensils! – Include in your “don’t forget” list all of the food and drink items you will be bringing as well, especially if it’s something you can’t pack ahead of time (like something you have to keep in the refrigerator. It’s easy to forget to check the fridge before you leave). – Think about the time of day that the party is being held. If it’s right at lunch time, you probably want to serve more food, because people may not have had a chance to eat lunch. If it’s in the morning you can serve brunch food and coffee/OJ/milk (check out Audrey’s Pancakes and Pajamas Party for a few brunch ideas!) If it’s in the afternoon, you can serve a dessert and a couple little finger foods to snack on. – Always serve drinks – water, punch, lemonade, and tea are some good options. If there will be small kids at the party, serve kid friendly drinks like juice boxes that won’t spill easily. – Don’t forget favors. 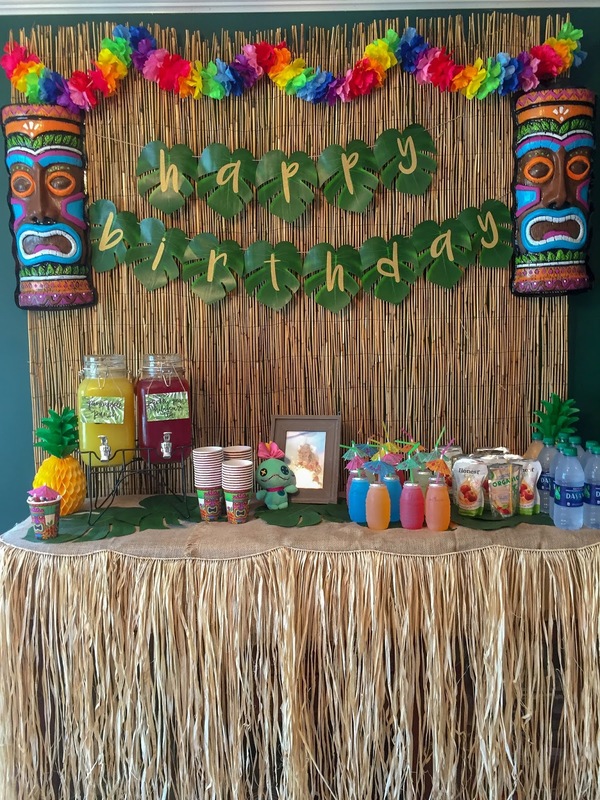 You don’t have to spend a ton of money on favors, but they do need to be in keeping with the theme of the party. Honestly, I kind of wish this were a trend that would fade out because half the time, I feel like it’s wasted money, especially for kids parties. For me, it relieves a ton of stress when I take the process one step at a time and write everything down in list form. 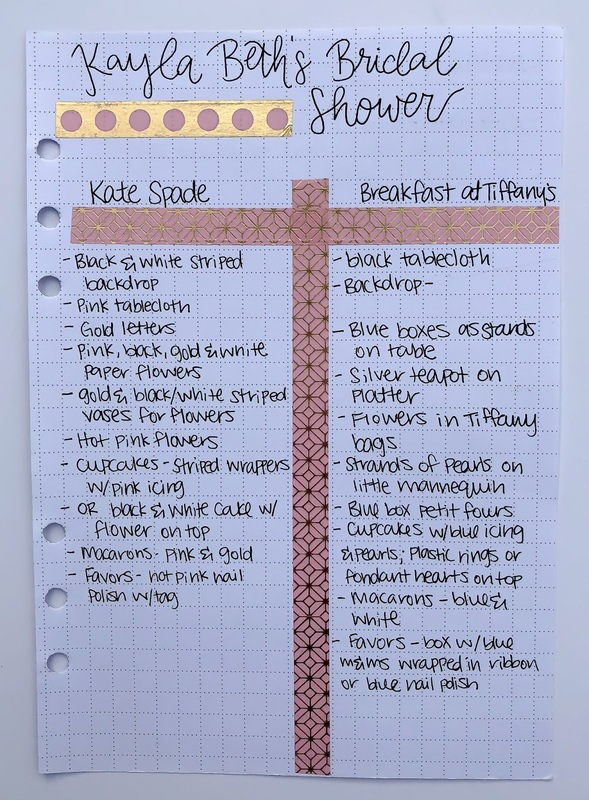 Some people aren’t list makers, but they are what keep me sane and organized! 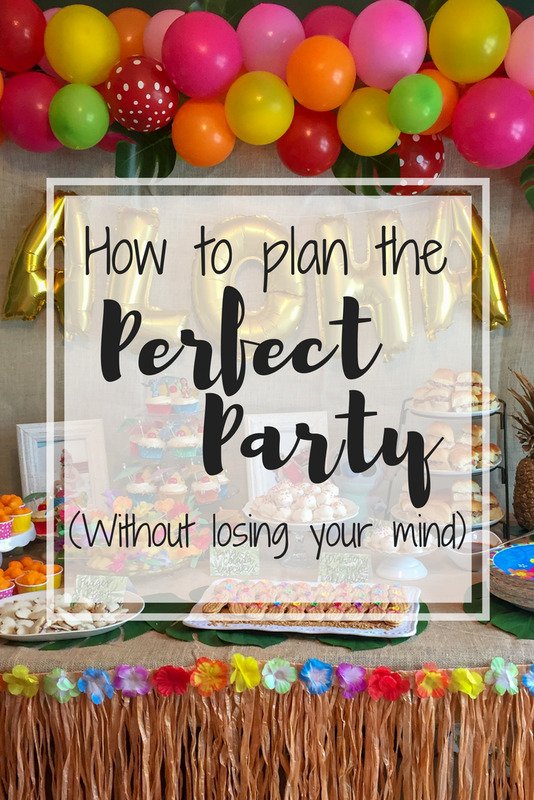 Do you have any other tips for planning the perfect party that you think I should add? How do you feel about favors?